In private homes it’s a great solution for terraces, porches, balconies, verandas, gazebos and conservatories being both flexible and offering an effective barrier against the elements. The doors fold open to the side and since it’s a modular system there is no limit in terms of width. Its main feature is the absence of frames between the individual doors, creating an all-glass effect that gives light to every room. 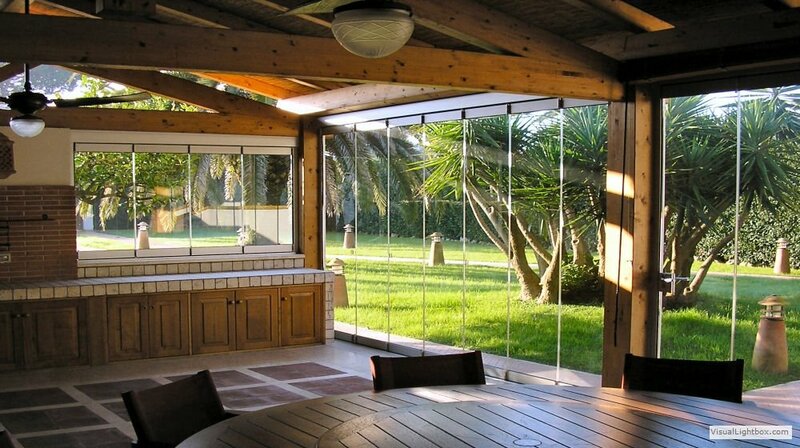 Protection from atmospheric elements is guaranteed by transparent polycarbonate seals between the individual doors and from a system of seals in EPDM. GIEMME SYSTEM is constantly tried and tested in compliance with applicable regulations (UNI EN 14351-1: air permeability, water tightness and wind and impact resistance). 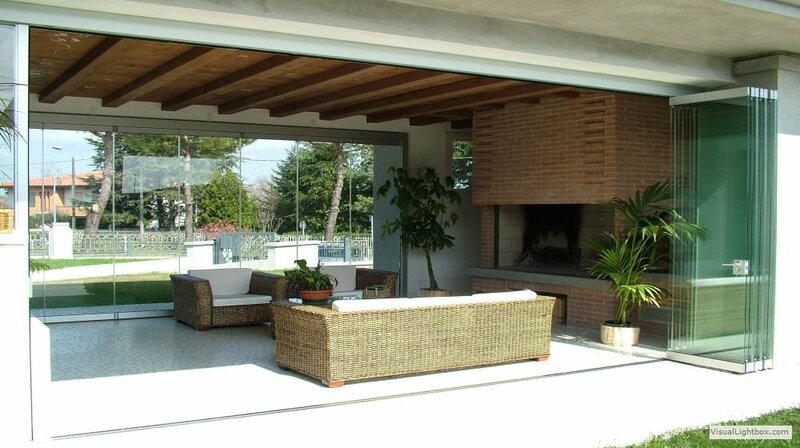 Refined and elegant, the GIEMME SYSTEM folding glass doors are well suited to any type of architecture. 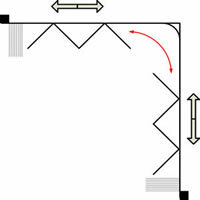 A corner without mounts allows you to see “all-glass” when the doors are closed and enjoy the corner free from obstruction when the doors are open. In addition, the special “curve-angle" system applied to the corners without mounts allows the doors to exceed angles of 90 degrees, making it particularly useful in situations when you want to fold the doors up to one of the two sides, perhaps against a wall or other niche. All solutions can be customized depending on the needs of the customer. For example you could decide that one of the glass panels should function like a door (therefore with the corresponding lock and handle) when the system is closed and then disappear folded up with the other panels when the system is open. You can choose from an infinite range of finishes for the aluminium (anodized, painted, wood effect etc.). Instead for the glass, in addition to traditional clear, frosted or extra clear you could have stained glass or screen-printed. Customers will have various types of floor guide rails at their disposal. Recommendations will be given according to the various functional requirements and in some cases it could be possible to go without. GIEMME SYSTEM is noted for its attention to the smallest details, such as glass doors installed on balconies and terraces on the upper floors being equipped with a detachable hinge system, and thus enabling effective cleaning on the outside whilst staying comfortable on the inside. It’s folded and stacked at the mounted side and is even available without a floor rail, up to a maximum of four panels. It can be closed externally or internally. Available without a floor rail and up to a maximum of 7 panels (stacked on both sides 4+3). Door with lock and handle in aluminium with external or internal closure. Corner without mounts and with magnetic seals. This system allows you to fold up all the panels to one point. Thanks to the curved floor guide rail, the doors from one side glide past the corner easily and fold together with the others. It’s only available with internal opening and with embedded or external floor guide rail.